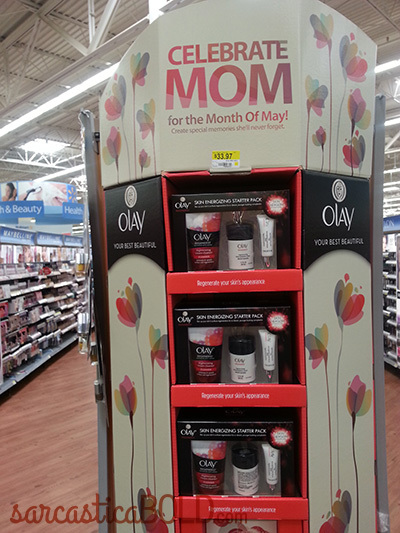 I was (unhappily) at a Wal-Mart the other day, and happened upon this display of “gifts” with which to “Celebrate Mom”. First of all, why are you shopping for gifts for Mom at Wal-Mart? I guarantee you, she’d rather have a gift card to Starbucks or an inexpensive mani/pedi than anything you’ll find here. Secondly, if you buy the mom in your life an Olay anti-aging starter pack, you may as well tell her she looks old, wrinkly, and tired. Let’s be honest – the chances are pretty good that the reason Mom looks old, wrinkly, and tired are directly related to you. Do you really want to open up THAT can of worms? Bottom line: if you’re shopping for gifts for the mom(s) in your life…maybe bypass this display. Unless you want wrath and hormonal outrage levied upon you. “Unless you want wrath and hormonal outrage levied upon you.” -Hahaha!!! I love it! !